There is no deficit problem. The deficit is down about 50 percent as a share of gross domestic product just since President Bush’s fiscal year 2009 deficit and is falling at the fastest rate since the end of World War II. Yet the Washington debate is about how and where to cut us back into recession. Why? Congress should just repeal the sequester – we don’t need it. We have 10 years to fix the long-term deficit situation. We should not be stampeded by deficit-scare propaganda and instead take the time to carefully consider the right approach. That way we won’t make the mistakes that Europe is making. Once again, because it might be hard to register due to the drumbeat of deficit-scare propaganda, this is a fact: the deficit is falling at the fastest rate since the end of World War II. It is down about 50 percent as a percent of GDP just since Bush’s huge $1.4 trillion fiscal 2009 deficit. And the deficit is projected to be stable for a decade. All of that means that no, we do not have a “deficit emergency,” the deficit is not “out of control” and we have 10 years to decide how best to fix things. So let’s stop listening to the drumbeat of “deficit shock” propaganda and not be rushed into doing any more stupid, destructive cuts in the things We, the People do to make our lives better. You probably hear again and again that Medicare is the driver of future deficit trouble. Here is something you probably didn’t know because of the drumbeat of deficit propaganda: Medicare cost growth is way down. From 2000 through 2009, Medicare spending climbed by an average of 9.7 percent a year. Now those increases are down to 1.9 percent and are still falling. The very slow growth in Medicare spending in fiscal year 2012 follows slow growth in 2010 and 2011. In 2010, spending grew at only 1.8 percent per beneficiary, and in 2011 at 3.6 percent. Over the three year period from 2010-2012, Medicare spending per beneficiary grew an average of 1.9 percent annually, or more than 1 percentage point more slowly than the average annual growth of 3.2 percent in per capita GDP. It’s an indisputable fact: The budget deficit is getting smaller. … But when Bloomberg News commissioned a survey asking Americans whether they believed the budget deficit was growing or shrinking, just six percent answered the question correctly. Ninety-four percent had no clue. And 62 percent actually thought it was getting bigger. A 62 percent majority believe the deficit is getting bigger, 28 percent believe the deficit is staying roughly the same, and only 6 percent believe the deficit is shrinking. Here it is, louder: Only 6 percent believe the deficit is shrinking! 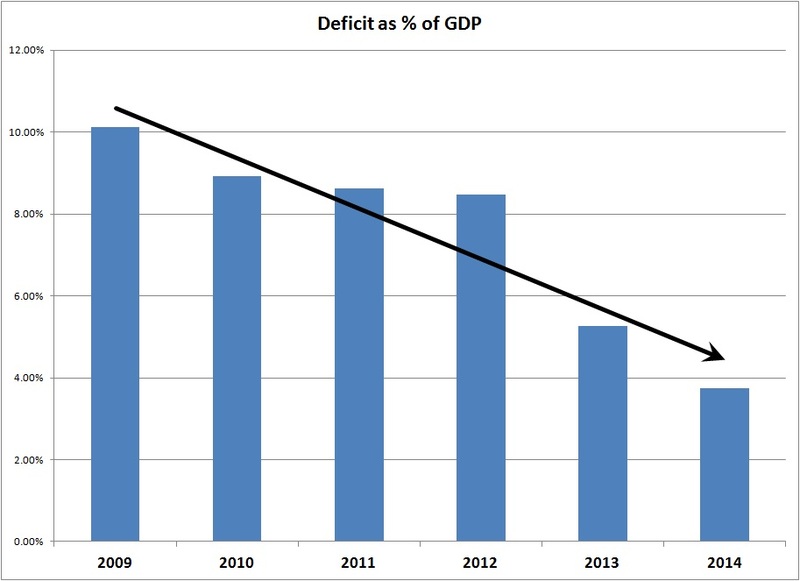 But here’s the thing: the deficit is shrinking dramatically. That is not a political opinion; it’s just math. Got that? Every time the nation has reduced the deficit this much, this quickly, economic growth suffers to the point that the economy actually shrinks. Isn’t it the media’s job to inform the public, not misinform the public? Isn’t correct, accurate, objective information necessary for the proper functioning of a democracy? What does it say about our country’s information channels, when only 6 percent of the public knows that the deficit is shrinking? Shouldn’t that be a signal to the media to run headlines for a month informing the public, instead of continuing to scare people that the deficit is going to eat them up? When only 6 percent of the public knows the facts (the deficit is falling fast, it is just math, not political opinion) about the most serious policy discussion that is occurring, with the most serious consequences for our jobs, standard of living, our future … a 94 percent misinformation rate is so far beyond just media incompetence that it has to be looked at as something else. “Blowback” is a term that means propaganda you use against a target comes back and hurts you. Anti-government propaganda has convinced the public that “government takes money out of the economy” and “government is in the way of business.” Other propaganda has convinced people that we have a “deficit emergency.” This propaganda is paid for by billionaires and the corporations that mask them, with a vast apparatus that distributes the misinformation. The billionaires and giant multinational corporations want to cut their taxes and get government rules out of their way. But now they’re killing the economy that laid their golden egg. Austerity – budget cuts – hurt the economy. They reduce the pressure to make the wealthy pay their taxes, but they cut economic growth for the rest of us. Europe is engaged in a grand experiment with austerity, and we can see the results. They cut their budgets, their economies decline, less tax revenue comes in the door, and their deficits as a percent of GDP actually go up making the problem worse. Unfortunately, their leaders think that means they should cut even more. The result has been that their economies decline even more, revenue falls even more, and their deficits as a percent of GDP actually go up, making the problem worse. Unfortunately … you get the picture. Unfortunately they don’t. So we don’t have a “deficit emergency” or a “fiscal crisis” or an “out-of-control” deficit after all. But we still have the “sequester” budget cuts starting Friday, and the consequences to our economy are really bad. Congress needs to just repeal the sequester. They do not need a “deal” to cut something else out of the budget. Common sense might suggest that if a thug is holding a kid hostage and demanding money you don’t offer him half the money and say he can shoot half the kid. That is a “balanced” response to hostage-taking. But it is not the correct response. Just repeal the sequester. And instead of cutting, how about repairing the country’s infrastructure, which means a lot of people get hired! And it means we have a modern, competitive infrastructure making our lives and businesses better. 2013, 2014 deficit estimates: http://www.foxbusiness.com/government/2013/02/05/cbo-sees-fy-2013-budget-deficit-at-845b-smallest-since-08/?